Everyone knows the grainy photographs that appear to show some unidentified creature emerging from the depths of Loch Ness, many of them dismissed as hoaxes. But what explanation can there be for the countless unsettling eyewitness accounts of the Loch Ness Monster recorded over the years? The earliest sighting dates to the sixth century. 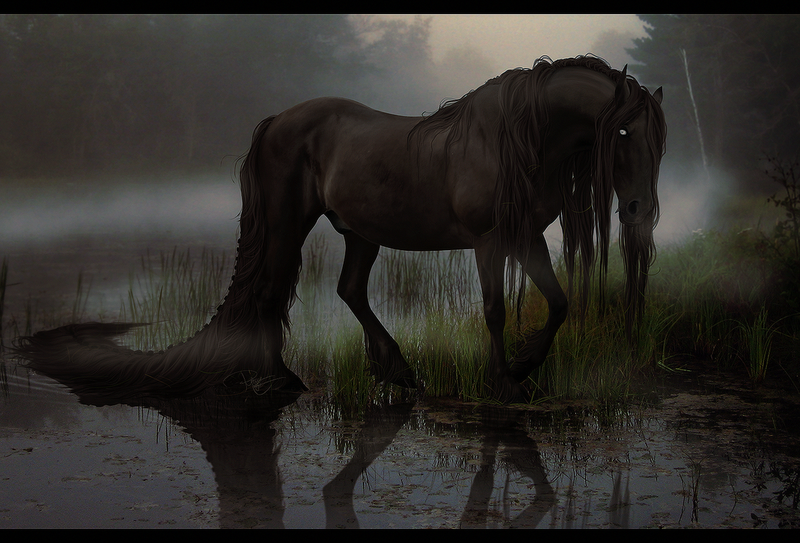 The Irish monk Saint Columba was on his way to Inverness to visit the King of the Picts when he crossed paths with the fearsome creature on the shore of the loch which had been terrorising the locals. Making the sign of the cross, Columba commanded the creature to return from whence its came. The monster miraculously obeyed and disappeared beneath the waves. Throughout the centuries, the sightings have continued. Does a monster inhabit Loch Ness to this day? At 23 miles long and a depth of 755 feet, there’s certainly more than enough water to hide in. 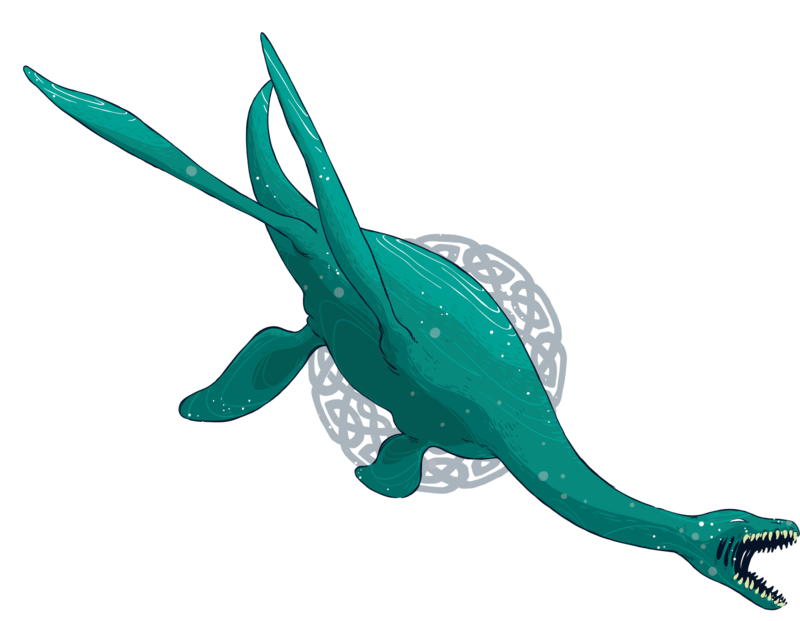 Gazing out across this vast stretch of water from the shore or the deck of a boat, keep a watchful eye for the strange ripples and swells left by the wake of some elusive but immense animal. And if you’re really lucky, maybe an ink-black hump or slender neck rising above the waves. 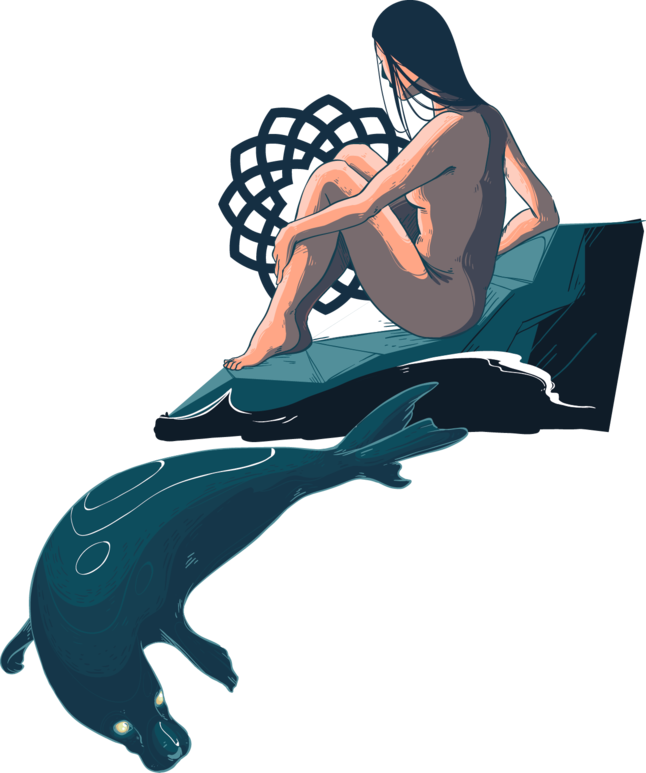 Horror: Nessie – long, dinosaur-like water creature, that shy’s from view of men. Hunger: Secrets – Nessie is peculiar Whisperer. Instead of her knowing everybody’s secrets – she want to be a secret for others to pursue. She is showing herself, across decades, for a glimpse of moment or photography shot – to hide herself once again another time. She sates her Hunger by watching, from afar, all those people going crazy over her sighting, obsessing their perusing ‘Loch Ness monster’. Across years there were also handful of mages that become really obsessed over her – and Nessie becoming their proper Obsession – that became here Kin, even when it was she more watching them than other way around. Last edited by wyrdhamster; 04-18-2018, 02:35 PM. Angered by King Minos' disrespect, Poseidon plotted to punish him for his arrogance and hubris for not sacrificing white bull. He punishes Minos by instilling a passion within the king's wife, Pasiphae, for the bull that came from the sea. Queen, plagued by her divinely inflicted desires, sought the help of Daedalus and Icarus. For Pasiphae, Daedalus constructed a wooden cow coated with a real cow hide and placed it upon wheels. Daedalus, then, put Queen Pasiphae inside the structure and wheeled her into the meadow that her beloved bull grazed in. It was there that she met and laid with the bull, since the bull thought the wooden cow was real. It is from this union that the Minotaur was born. The queen named the beast Asterion (after King Minos' stepfather), which the Cretan people knew to be the Minotaur's true name. Upon seeing the infant, King Minos discovered his wife's bestial affair and as punishment, Minos enslaved Daedalus and Icarus for their parts in the affair, but he left Pasiphae untouched. Pasiphae cared for Asterion and was able to nourish Asterion while he was a bull calf. However, as he grew he became ferocious and monstrous and she was unable to feed or care for him any longer. Asterion was unable to find a suitable source of food, since he was neither man nor beast, and so he started to eat people. In order to hide his wife's disgraceful affair and on the advise of an Oracle, King Minos commanded Daedalus and Icarus to build a grand Labyrinth to house his wife's son: Asterion or Mintauros. Horror: Minotaur – creature with the head of a bull and the body of a man, a being "part man and part bull"
Hunger: Prey – Minotaur crave the flesh of his victims, but much more, he crave the chase after them. Lair: Labyrinth – ancient stone maze, locked in half darkness, lit only by few torches put on wall that makes place even more claustrophobic. Of course, we also do Horrors from mythology on commission from you, guys. Just point to the source myth or tale of it. <Dwells into my notes from Dragon Idigam Western form based on Christian myths...> It looks like another heavy ( XP full ) lifter. Notice: It is not known when the legend of St George and the Dragon was first told; some say as early as the sixth century. Possibly the tale existed as an oral tradition before it appeared in a twelfth-century prologue to a version of the martyr’s Passion. Some point 9th century Cappadocia of origin of tale. The legend of George and the Dragon in the West - The citizens of a town, desperate to control the depredations of a dragon which was devastating its fields, and poisoning the people with its breath, had resorted to sacrificing one unmarried girl and one sheep a day, drawn by lot, to the monster. One day the lot fell to the king’s daughter and, despite the pleas of her father, she was delivered to her fate, decked as a bride for marriage. Just then, a handsome young knight rode by. At first the princess was reluctant that anyone should risk himself against the monster, but St George insisted and wounded it with his lance – but only after making sign of Cross on to beast. The princess was then urged to lead the dragon towards the city with her girdle. There the saint would despatch the monster if all would become Christians. The princess accepted and St George performed a mass baptism, afterwards killing the dragon and instructing the building of a church. In other versions, he is offered money, land and the princess’s hand in marriage but generally refuses. Horror: ‘Classical’ Dragon – giant lizard with wings, thick scales and breathing fire. 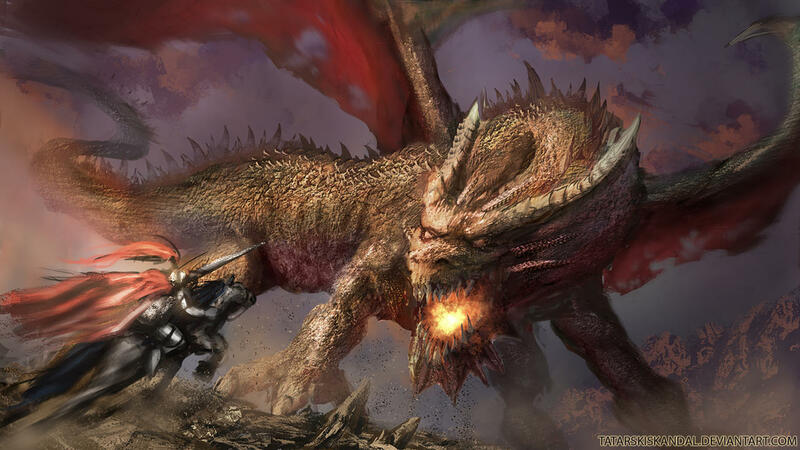 Hunger: Hoard – Dragon craves what people held deeply to their heart – and to take it or destroy. Their daughters are the most precious things to them. But he will he will not despise good old treasure. And crops devastation is reminding them about their need to eat and to appreciate food. Lair: Treasure Cave – vast cave, filled with gold, gems, treasures and captured victims. Addition: Even BtP corebook points for the Ugallu Collector combination for Dragons. ‘Some of the most iconic Collectors in legend have been Ugallu, vast winged dragons who perch in high places and look down upon the world from their glittering hoards. They have also been amongst the most successful, littering the ground beneath their lairs with the corpses of would-be thieves who have fallen to their deaths. Last edited by wyrdhamster; 04-22-2018, 04:34 AM. 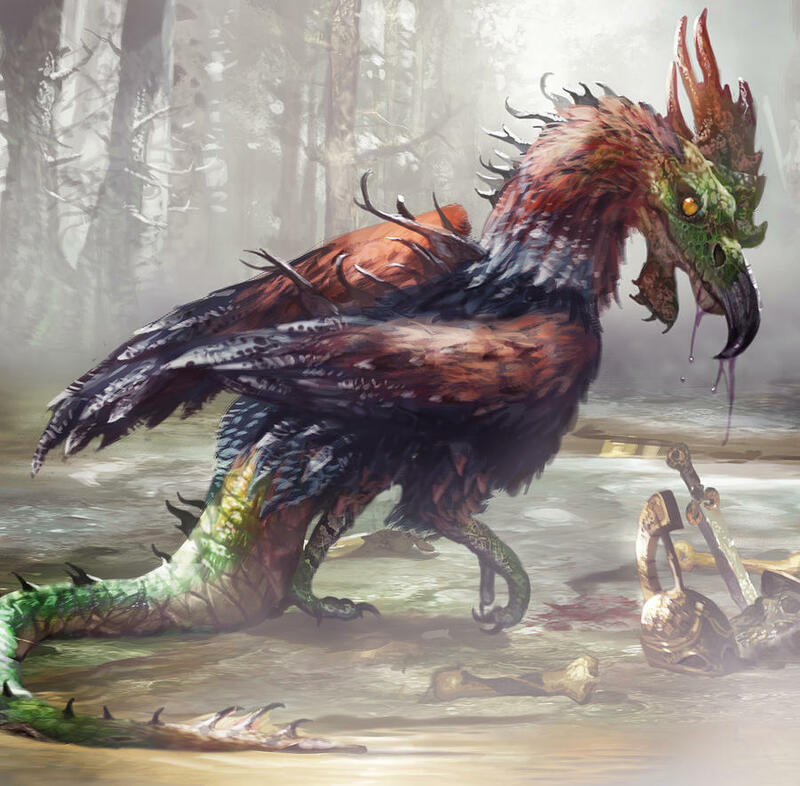 It would be interesting to see a cockatrice Horror. The roosters who can turn people to stone. The first description of a cockatrice appeared in the late twelfth century and was written by Alexander Neckam. A cockatrice is born when a rooster lays an egg that is hatched by a toad or serpent. Tales say that the rooster has to be seven years old and lay it under a full moon and the toad or serpent has to hatch it for nine years. The cockatrice has many formidable abilities. It kills people by turning them into stone with even the slightest glance of the creature’s eyes. It can also kill by touching them or, in some cases, breathing on them. It is believed that its saliva is so potently venomous that it can kill an elephant. Due to the fact that it looked like a small dragon, it was gradually added that it was capable of breathing fire and could kill with the sound of its voice. The cockatrice shares other characteristics with the basilisk. By mere touch or breath, the cockatrice can scorch grass, shatter rock, and kill bushes. It is supposed to be so poisonous that if a human tries to kill the creature with a weapon the venom will travel up, through the weapon and kill whoever held it. If the person were on horseback when it attacked the creature, it would not only kill the man, but the horse as well. Like the basilisk, the weasel is immune to the cockatrice’s glare and can be used to kill the beast. A cockatrice can also be killed instantly by hearing the crow of a rooster. The sound of the crow will give the cockatrice violent fits and it will thrash itself to death. It is also thought that if a cockatrice looks upon itself in a mirror it will die. Even after a cockatrice dies its ability to petrify are still effective. Horror: Cockatrice - a dangerous creature with a lizard body, snake tail, dragon wings and the head and legs of a rooster. Hunger: Ruin – In tales, Cockatrice is only doing means and destroying or terrifying people. Nightmares: Behold, My True Form!, Fear Is Contagious, Flying and Falling, This Isn't My Skin! Last edited by wyrdhamster; 04-19-2018, 03:01 PM.